Assess the need for coverage with just a few clicks! The needs check is an integral part of the comprehensive VERA.neo consulting system and can also be used as a standalone tool or within customer accounts. Whilst VERA.neo was developed for use by consultants, the needs check specifically addresses final consumers. With just a few clicks, your customers can quickly enter their own data and carry out a risk assessment on their need for risk coverage. The underlying software concept is simple: The system will request only as much data as required to comprehensively analyse all uncovered risks according to the DIN SPEC 77222 and recommend how they could be tackled. 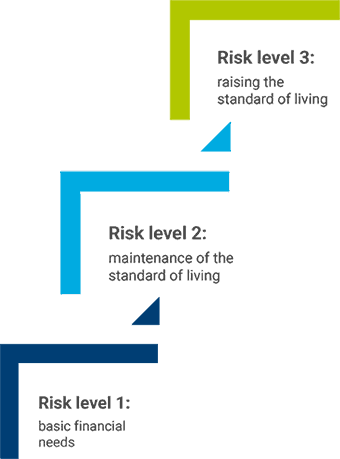 To precisely assess the personal risk situation, data relating to housing and living as well as professional and financial circumstances are requested. With the result of the needs check customers can decide for themselves whether they would like further advice on the identified needs. For consultants, the result provides the ideal basis to embark on needs-based consulting with VERA.neo or OASE.